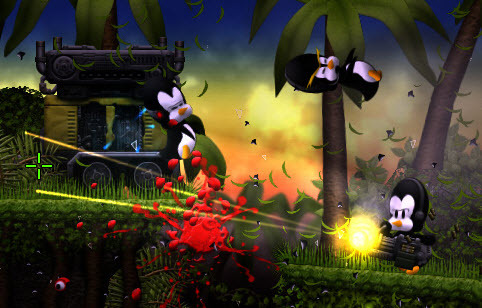 TAGAP 2 is a free apocalyptic game about Penguins. Play as cyber-penguins Pablo and Pedro and stop the Penguin Apocalypse. The new nemesis Primo brings his own special penguin forces with him. Plenty of weapons, combat vehicles and power-ups. Experience the entire campaign with a friend in splitscreen co-op mayhem. Slick retro-esque 2D gaming with 3D accelerated effects. Built-in level editor and simple scripting system make creation of game mods easier.